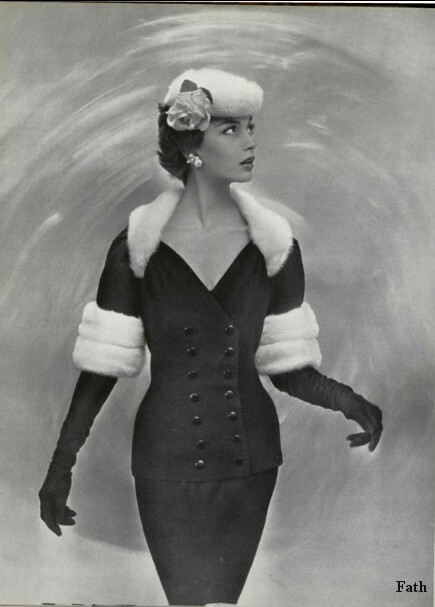 When I saw this suit in one of the 1955 editions of L'Officiel it was love at first sight. I loved the collar and original neckline. I loved the hat with the rose. I immediately started thinking of how I was going to make this beautiful suit for Gene. The biggest challenge was finding the white fur. All the stores in my area only carry cheap looking white fur. I haven't had much luck finding fur on the internet either. When I went down to the "Hollywood Ahoy" convention one of my goals was to find some white fur in the garment district. I scored! The fur on my suit is a little fluffier that the fur in the original suit, but sometimes that happens when miniaturizing fashions. For that same reason I wasn't able to make the cuffs look like they were pieced together. I tried, but the result was too bulky, and I didn't like effect. The next challenge was finding the fabric for the suit. I really wanted to make the suit out of the same silk crepe I used to make this coat, I had loved working with this fabric, it was like butter. I loved the texture, and weight of it. Unfortunately, I found it in a grab-bag I had bought and it was all gone. I ended up making one suit out of a textured polyester crepe (my copy) and five others out of lighter weight black silk crepe. The fur collar is attached to the suit with two hooks. The jacket could be worn without the collar for a different look. I need to take a picture of the jacket without the collar. The neckline is very lovely. I changed Tornado's lip color again to match the rose on the hat. I am still thinking about repainting her lips. I really like her in red. Oh La La in my copy made out of the textured crepe. I like this version too. I hoped you enjoyed my saga of the suit. My next project is a suit from the film "Lucy Gallant".